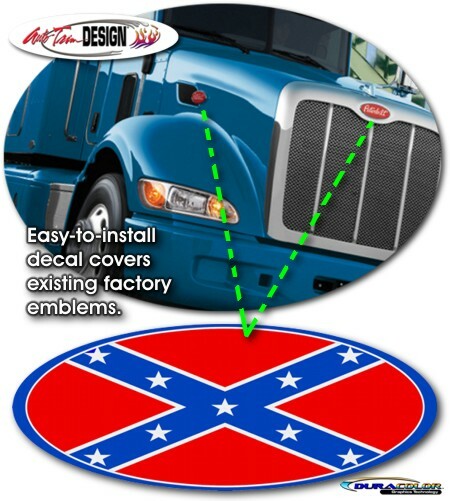 Detail your Peterbilt with this themed Confederate Flag decal that fits perfectly on the factory oval emblem of the rig's front grille or side hood areas. The decal is uniquely designed so it fits within the existing emblem's Chrome oval as shown in the picture. The decal is manufactured utilizing our DuraCOLOR process in Red, White, Blue and Black outlines and enhancements. Please measure your existing emblem(s) to make sure this decal will fit prior to ordering.